CyberGrants is a comprehensive and highly configurable grants management software that empowers foundations, large corporations, and nonprofits to improve how they impact communities by enabling them to automate the grantmaking process while having the opportunity to manage risk and maintain compliance. Inspiring both grantmakers and grantseekers, CyberGrants offers features that simplify every aspect of the grants lifecycle process and ensure that there is a smooth flow of information and communication between grantmakers and grantseekers. With CyberGrants, organizations can automatically track tax statuses as well as check data against existing watch lists which can be performed even when grants are already approved and awarded. CyberGrants permits users to access application data and review and approve applications regardless of their location and the device they are using, allowing them to expand their grants programs and promote their philanthropic missions across the world. Online and phone support is also provided to grantseekers so that all their inquiries with regard to their application and the organization they are requesting funding from are promptly addressed. In addition, users can integrate the software with their existing accounts payable and product ordering systems, letting them verify if their grant allocations comply with the budget policies and requirements being implemented by their organization and speed up disbursement tasks. CyberGrants enables them to easily obtain insights into their charitable efforts by generating and scheduling reports. CyberGrants delivers features that are specific to grantmakers and their staff. One of those features is budget tracking. This feature helps grantmakers check if their grant allocations are not going beyond the budget limits they have set for their organization. 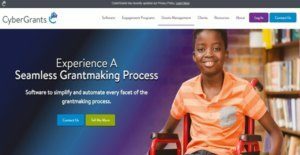 Another grantmaker-friendly feature offered by the software is the ability to create dashboards which can be tailored to the specific roles and functions being performed by employees and staff of the organization. This way, people within the organization can access information from interfaces that they are familiar with and conduct giving-related tasks from any location and at any time. With CyberGrants, the approval process is expedited. The software allows users to create rules that define how applications are approved. Approval processes can be executed either online or offline, and they can also be configured. Compliance and risk management is a unique feature included in CyberGrants. Users can track and validate the tax status of organizations that are applying for grants. For example, they can verify whether the organization is eligible for a tax exemption pursuant to Section 501(c)(3) of the US Internal Revenue Code. This section of the said code is the legal basis for giving federal tax exemption to nonprofit organizations, associations, and foundations if their primary activities are religious, charitable, scientific, literary, educational, amateur sports competition; and women, children, and animal cruelty prevention. As part of its compliance and risk management feature, the grants management software makes it possible for users to do a watchlist scan. Here, they will be able to check their data about the grantseekers they are engaging with against international watchlists and authoritative databases. Watchlist scanning is integrated into the software so users can directly do it within the software and no longer have to perform it separately using other sources. Since CyberGrants is a tool beneficial not only for grantmakers but also for grantseekers, the software provides a set of features that inspires and empowers grantseekers. At any point in time during the approval process, grantseekers can monitor the status of their grant application and check whether they are missing some grant requirements. As they complete and submit the needed grant requirements, they will be able to track the progress of their application. There is a time-saving feature available in CyberGrants that allows grantseekers to answer pre-screening questionnaires. They can do this independently. As a result, they can immediately determine if they are qualified for the grant programs being implemented by the organization, preventing them from wasting their time applying for grants that they are not qualified for. CyberGrants also enables grantseekers to join in a vast network where they can view available grant programs from various organizations, apply for those programs, and access their pending and approved grant applications across the organizations they are dealing with. What’s great about this is that they will be able to access such network using a central login, enabling them to manage their grants in one place and follow up on pending grant applications effortlessly. If you are interested in CyberGrants it could also be beneficial to check out other subcategories of Best Grant Management Software collected in our database of SaaS software reviews. Every enterprise is different, and can require a particular type of Grant Management Software solution that will be adjusted to their business size, type of clients and staff and even individual niche they cater to. It's not wise to count on finding an ideal app that will work for each company no matter what their history is. It may be a good idea to read a few CyberGrants reviews first and even then you should keep in mind what the service is supposed to do for your business and your staff. Do you need a simple and intuitive app with just essential functions? Will you really use the complex tools needed by pros and big enterprises? Are there any specific features that are especially beneficial for the industry you operate in? If you ask yourself these questions it will be much easier to find a solid service that will fit your budget. How Much Does CyberGrants Cost? CyberGrants provides SMB and enterprise pricing plans which are calculated based on the complexity of your needs and components of your grant programs, and the number and type of users who will utilize the software. For more details and to obtain a quote, please contact the vendor’s sales team. We realize that when you make a decision to buy Grant Management Software it’s important not only to see how experts evaluate it in their reviews, but also to find out if the real people and companies that buy it are actually satisfied with the product. That’s why we’ve created our behavior-based Customer Satisfaction Algorithm™ that gathers customer reviews, comments and CyberGrants reviews across a wide range of social media sites. The data is then presented in an easy to digest form showing how many people had positive and negative experience with CyberGrants. With that information at hand you should be equipped to make an informed buying decision that you won’t regret. What are CyberGrants pricing details? What integrations are available for CyberGrants? CyberGrants can be integrated with your existing accounts payable and product ordering systems. If you need more information about CyberGrants or you simply have a question let us know what you need and we’ll forward your request directly to the vendor.